Making and Being book cover, video stills, workshop image, card game, and interactive interface. BFAMFAPhD is a collective of artists and educators that employs visual and performing arts, policy reports, and teaching tools to advocate for cultural equity in the United States. Our work as a collective is to bring people together to analyze and reimagine relationships of power in the arts. In 2014 we (Susan Jahoda and Caroline Woolard) self-published Artists Report Back to raise awareness about art student debt, to suggest how established artists and recent arts graduates might advocate for one another, and to propose cultural equity initiatives to recognize and strengthen solidarity art economies in the United States.1 Our Report received national attention, placing us in dialogue with student organizers, policymakers, administrators, and government officials.2 Although Artists Report Back used quantified data to advocate for structural change in higher education, it did not focus on what happens in the classroom: on arts pedagogy. This is the focus of our new publication effort. In late 2014, we began working on a multiplatform pedagogical project. With illustration, design, and pedagogical support from Fellow Emilio Martinez Poppe, we created a book, a series of videos, a deck of cards, and an interactive website with freely downloadable content called Making and Being: A Guide to Embodiment, Collaboration, and Circulation in the Visual Arts. Our project is a contribution to the ongoing work of the larger collective, BFAMFAPhD, and is motivated by an understanding that, as teachers in BFA and MFA programs, spaces of learning may be some of the only places where students can find a community of people who do not question the value of the arts. And yet, while we appreciate project-based and experiential learning in studio arts pedagogy, we believe that studio programs may be failing students and faculty who want to talk about collaboration, healing, politics, and/or political economy. We developed a card game to offer students and faculty a resource to encourage discussions and/or art projects about these topics. Making and Being, exhibition at the Dekalb Gallery, Pratt Institute, PROJECT THIRD residency, summer 2018. Photograph by Daniel Terna. a support practice: the ways in which artists’ needs are met in order to rest, dream, and work on any project. The card game invites students to approach projects holistically, looking at their own learning goals and the life and death of their projects in relation to their social and emotional needs. Rather than thinking exclusively about form, theme, or context, the prompts place these approaches to art making within a framework that includes the circulation of artists and of artworks. Each card concludes with a reminder to notice the generative contradictions that arise when you locate what is possible and impossible on different scales: individually, interpersonally, and institutionally. A student might draw a prompt that asks them to practice skillful listening (capacity) as they mediate conflict (a phase of labor), while acknowledging that the completion of the project relies upon earning money through their day job (a practice of support). The student might interpret the prompt to make a drawing, video, or photograph that reflects upon a moment of listening and mediation at work. The prompt might enable discussions with students such as: What would it mean to understand support (or any of the phases in the lifecycle) as integral to your process as an artist? For teachers, reflecting on their own professional practices as mediators of a discipline, the card might prompt questions such as: Where will graduates of our programs go with the disciplinary knowledge of painting or sculpture, and the ability to paint or sculpt, but no understanding of the mechanisms that enable their projects and ideas to circulate in the world? A student might receive a prompt that reads: “Practice group coordination as you recycle materials. Don’t forget to listen to others.” In creating this prompt, we used Generative Somatics’ definition of coordination as being “reliably able to effectively collaborate with others in teams, partnerships, and alliances, and remain responsive to evolving conditions.”3 The student might decide to create a project in collaboration with members of a sustainability student group on campus. They might decide to learn about the group by participating in their meetings and by interviewing members one-on-one about the history and current practices of the recycling program on campus. After listening to members of the group, the student might decide to create a large-scale project, including audio recordings, as well as found materials from one of the school’s recycling centers. Another student, interacting with the card game during project work in class, might take the same prompt as described above (“Practice group coordination as you recycle materials. Don’t forget to listen to others.”) and create a series of drawings using materials recycled from a prior project. Over the course of an in-class production workshop, the student might challenge themselves to listen more closely in general, which may translate to active listening: asking someone who is rarely listened to if they would like to speak up, or encouraging their peers to also listen to that student. Our Making and Being Card Game is part of a larger multiplatform pedagogical project currently underway. We are writing a book, Making and Being: A Guide to Embodiment, Collaboration and Circulation in the Visual Arts, due to be published in the summer or fall of 2019. The other facets of the Making and Being project are a book, a series of videos, a deck of cards, and an interactive website with freely downloadable content, each of which offers practices of collaboration, contemplation, and social-ecological analysis for visual artists. Making and Being is for arts educators who want to connect art to economy; for students who want to make artworks that reflect the conditions of their own production. Making and Being provides a framework that asks artists to explore both who they are becoming as they make projects, and what their projects are becoming as they take shape and circulate in the world. 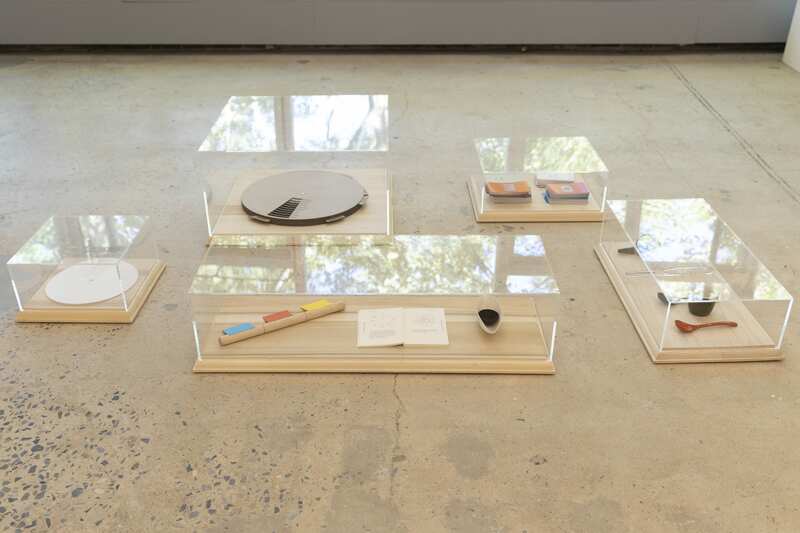 Making and Being, pedagogical tools, exhibition at the Dekalb Gallery, Pratt Institute, PROJECT THIRD residency, summer 2018. Photograph by Daniel Terna. 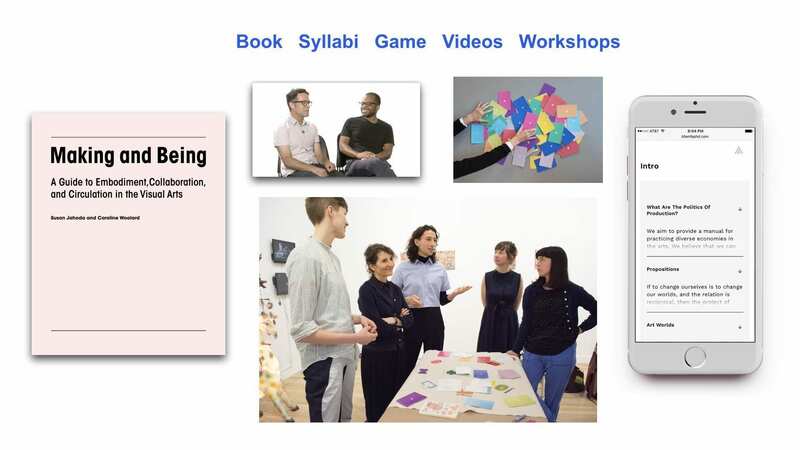 The Making and Being Card Game draws from the frameworks in the larger pedagogical project, which aim to connect art to economy and to support artists who want to make artworks that reflect the conditions of their own production. We created a card game in addition to our book, because a card-based method allows students to work with a specific prompt for a project while beginning to sense the larger conceptual framework that structures our book. The structure of the card game encourages learners to confront the topics of an artist’s capacities, production processes, and means of support in a playful, but thoughtful and embodied way. 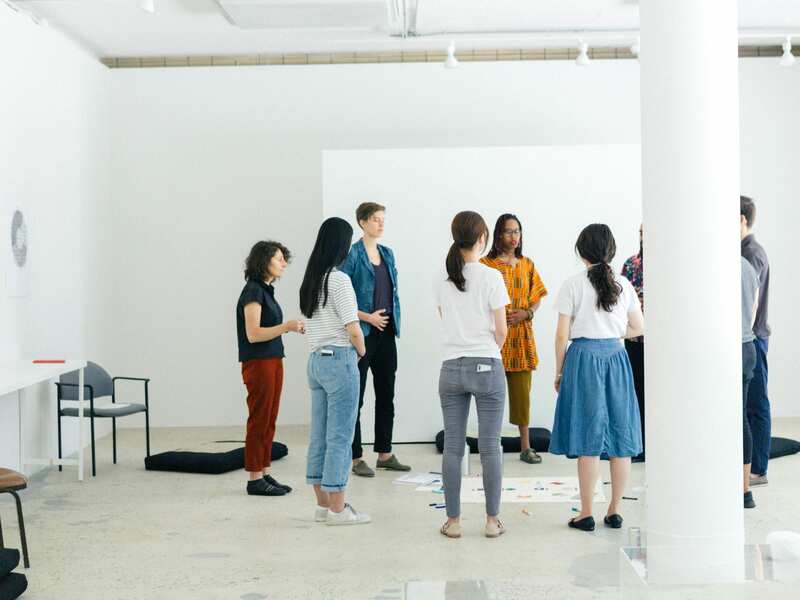 Making and Being, workshop with Jeff Kasper’s class, exhibition at the Dekalb Gallery, Pratt Institute, PROJECT THIRD residency, summer 2018. Photograph by Daniel Terna. aim to understand the historical forces, root causes, and conditions that make their present moment, personal experiences, and worldview possible (critical). what their bodies already know and need. Somatic and embodied practices and activities respect the whole body, working with all states of dis/ability. It is vital to connect all aspects of our sensing, thinking, feeling, moving bodies (somatic). Making and Being Card Game, early prototype, 2015. Photograph by BFAMFAPhD. Play the Making and Being Card Game, created for Art Journal Open, here. Download the Making and Being Facilitator Guide here. BFAMFAPhD is a collective that employs visual and performing art, policy reports, and teaching tools to advocate for cultural equality in the United States. The work of the collective is to bring people together to analyze and reimagine relationships of power in the arts. BFAMFAPhD received critical acclaim for Artists Report Back (2014), which was presented as the 50th anniversary keynote at the National Endowment for the Arts and was exhibited at the Brooklyn Museum, the Museum of Art and Design, Gallery 400 in Chicago, Cornell University, and the Cleveland Institute of Art. 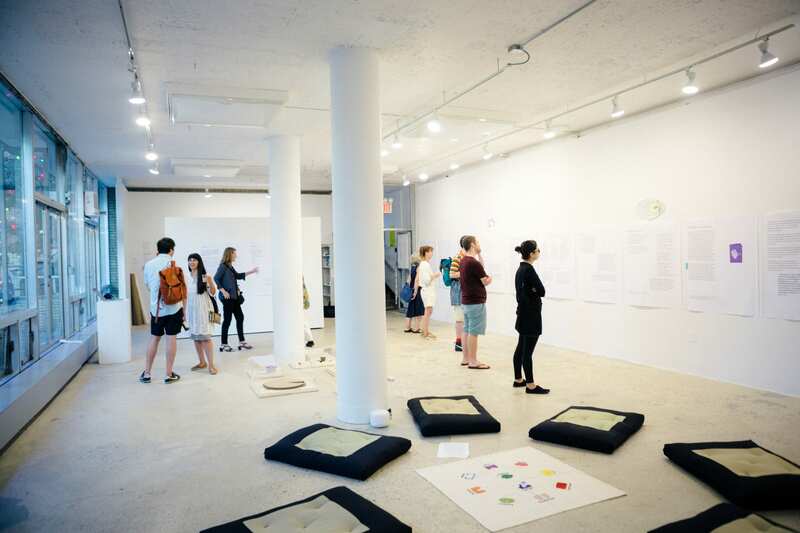 Their work has been reviewed in The Atlantic, the New York Times, the Washington Post, The New Yorker, Andrew Sullivan’s The Dish, WNYC, and Hyperallergic, and they have been supported by residencies and fellowships at the Queens Museum, Triangle Arts Association, NEW INC, and PROJECT THIRD at Pratt Institute. 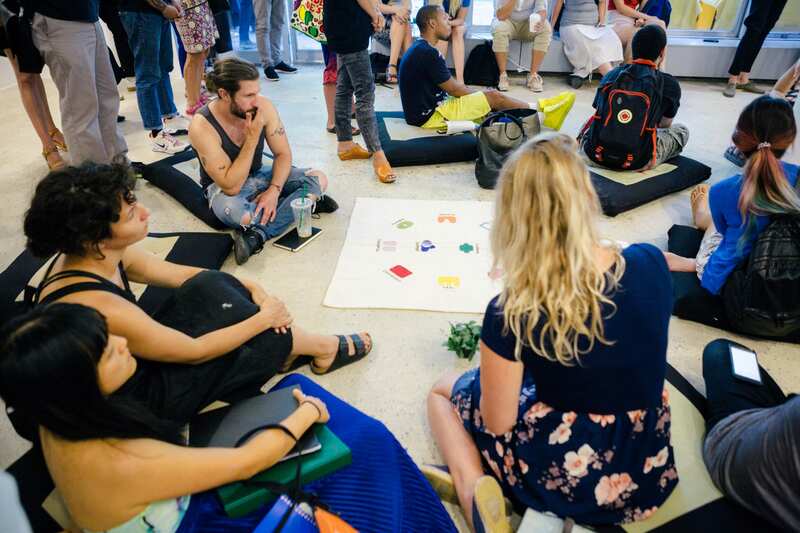 BFAMFAPhD members Susan Jahoda and Caroline Woolard are now working on Making and Being, a multiplatform pedagogical project that offers practices of collaboration, contemplation, and social-ecological analysis for visual artists. Making and Being is a contribution to BFAMFAPhD made by Susan Jahoda and Caroline Woolard. Susan Jahoda is a professor in studio arts at the University of Massachusetts, Amherst, and Caroline Woolard is an assistant professor of sculpture at the University of Hartford, CT. Currently supporting this project are BFAMFAPhD collective members Agnes Szanyi and Vicky Virgin. Agnes Szanyi is a doctoral student at The New School for Social Research in New York, and Vicky Virgin is a research associate with the Mayor’s Office for Economic Opportunity in New York. From 2016 to 2018, Emilio Martinez Poppe was a Fellow supporting Making and Being.